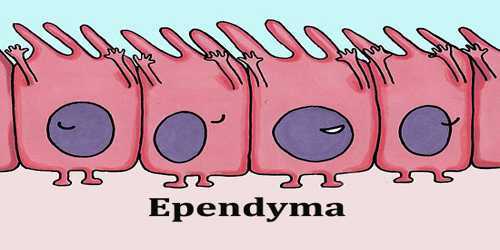 Ependyma is the membrane lining the ventricles of the brain and the central canal of the spinal cord. It is one of the four types of neuroglia in the central nervous system (CNS). It is involved in the production of cerebrospinal fluid (CSF), and is shown to serve as a reservoir for neuroregeneration. Ependymal cells, which create cerebral spinal fluid (CSF), line the ventricles of the brain and central canal of the spinal cord. These cells are cuboidal to columnar and have cilia and microvilli on their surfaces to circulate and absorb CSF. 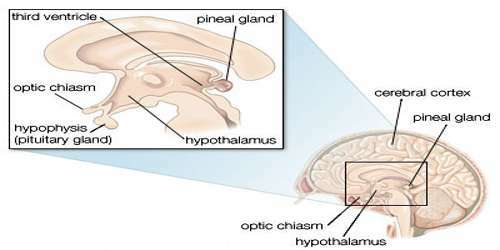 Ependymal cells also give rise to the epithelial layer that surrounds the choroid plexus, a network of blood vessels located in the walls of the lateral ventricles, the two largest ventricles, which occur as a pair in the cerebral hemispheres. Ependymal cells, similar to all other neuroglia, are derived from a layer of embryonic tissue known as neuroectoderm. The basal membranes of these cells are characterized by tentacle-like extensions that attach to astrocytes. In the ventricles ependymal cells possess tiny hairlike structures called cilia on their surfaces facing the open space of the cavities they line. The cilia beat in a coordinated pattern to influence the direction of flow of cerebrospinal fluid (CSF), bringing nutrients and other substances to neurons and filtering out molecules that may be harmful to the cells. The ependymal cells in the ventricles are loosely joined together by special intercellular adhesion sites called desmosomes, which enable the cells to form a nearly continuous epithelial sheet over the surface of the ventricles and spinal canal. Another type of ependymal cell, known as a tanycyte, is found only in the lining on the floor of the third ventricle in the brain. These cells are unique from other ependymal cells in that they have long processes and large “end feet” that connect to brain capillaries and neurons distant from the ventricle. They give rise to the epithelial layer surrounding the choroid plexus in the lateral ventricles of the cerebral hemisphere. These epithelial cells mainly produce cerebro – spinal fluid. 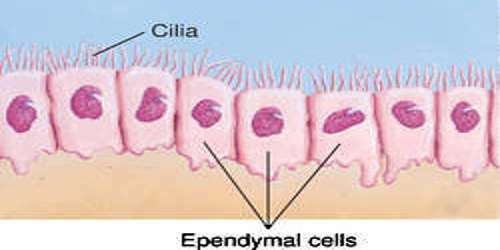 The ependymal cells have cilia , facing the cavity of the ventricles. The co ordinated beating of cilia influences the direction of flow of the cerebro spinal fluid, distribution of neuro transmitters and other messengers to the neurons . Ependymal cells called tanycytes line the floor of the third ventricle in the brain. Tanycytes play an important role in the transport of hormones in the brain. 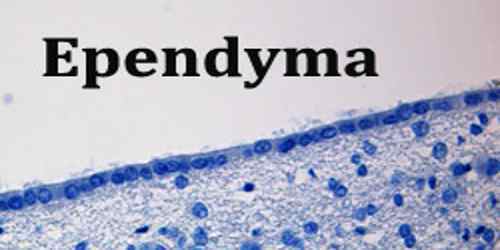 Ependymal cells are derived from a layer of embryonic tissue known as neuroectoderm.